PDF (Portable Document Format) is a popular document format. Best thing about PDF is that no one can edit this document. This is the main reason it is used to create ebooks and official documents. There are many tools which lets us create PDF files. We can also use MC word to create new PDF documents. Many times, we need to edit PDF files or change it into another file format. For this, we need a PDF manipulation tool. There are so many tools and online services available which allow users to convert PDF to doc or into some other formats. 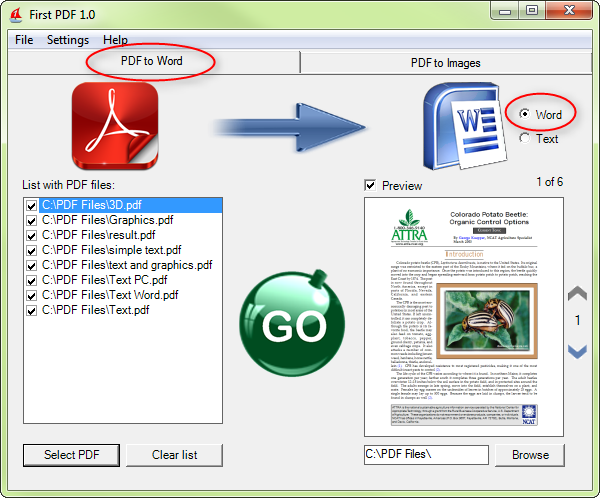 First PDF is one of those PDF manipulation tools which can convert pdf to doc. It can convert PDF files into DOC and other image formats including PNG, JPEG, TIFF, BMP, GIF and Multi TIFF. It is worth to mention that the tool retain the all kind of text formatting, layout, tablets and graphics of the PDF that makes it different from others. This PDF to Word DOC converter tool is free and you can download it from this link. To perform the conversion, select the Word option inside the PDF to Word tab in the tool. Now you can either add a file via drag and drop or by browse. Then select the output directory to save the file. Then click on GO to convert the file. You can also convert PDF into an image by using similar process. This tool needs very low hardware and software specification. So it runs really fast. It supports all available Windows Operating systems from Windows ME to Windows 7. Use First PDF to convert PDF files into Word documents and share your personal experience with the tool via comment. If you know another nice PDF to DOC converter tool that must be in the list, please share it with us via comments.